To make idli, two parts uncooked rice to one part split black lentil (Urad dal) are soaked. The lentils and rice are then ground to a paste in a heavy stone grinding vessel (aatu kal). This paste is allowed to ferment overnight, until it expands to about 2½ times its original volume. In the morning, the idli batter is put into the ghee-greased molds of an idli tray or "tree" for steaming. These molds are perforated to allow the idlis to be cooked evenly. The tree holds the trays above the level of boiling water in a pot, and the pot is covered until the idlis are done (about 10-25 minutes, depending on size). The idli is somewhat similar to the dosa, a fried preparation of the same batter. A variety of nontraditional idlis exist these days, namely, standard idli, mini idlis soaked in sambar, rava idli, Kancheepuram idli, stuffed idli with a filling of potato, beans, carrot and masala, ragi idli, pudi idli with the sprinkling of chutney pudi that covers the bite-sized pieces of idlis, malli idli shallow-fried with coriander and curry leaves, and curd idli dipped in masala curds. Ramasseri, an offbeat village in Palakkad is known all over Kerala for the idlis it make - the delicious Ramasseri Idli. Spongy and soft Ramasseri Idli is slightly different in shape from the conventional idlis. It is a little flat and round. Ramasseri Idli is eaten with Podi mixed in coconut oil. The beginning was from a Muthaliyar family living near Mannath Bhagavathi Temple in Ramasseri near Elappullly.The recipe of Ramasseri idli dates back to about one century,which again is a trade secret. The Muthaliyar family was migrated to Palakkad from Kanchipuram in Tamil Nadu. The new generation in the profession says that the secret of the recipe and taste were handed down to them from grand old women of the community. Now the idli business is confined to four families in Ramasseri. Selection of rice is very important in making Ramasseri idli. Usually the varieties used are Kazhama, Thavalakannan, Ponni etc. The taste starts from the boiling of paddy itself. Drying and dehusking are also important. It is done in a particular way. The combination of rice and black gram is also equally important. For 10 kg of rice, one kg of black gram is used. 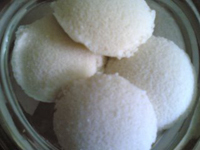 Idli is made only after four hours of fermentation. Steaming of the idli is done on a cloth covered on the mud pot using firewood. This provides special taste to the preparation.